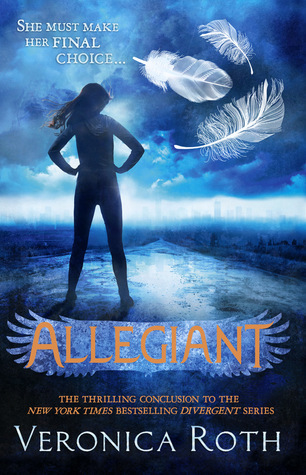 First of all, I want to say thank you so much to HarperCollins for giving me a copy of Allegiant way back November 2013. Since that time, I tried to open it once but then I failed on finishing it, I wasn't ready to end the series just that. So I got another opportunity and this time I was able to finish the book, and to be honest I can't decide if that was a good decision or not. Thinking that one of your character died is so sad and annoying. My last reaction was "OMG WHY V.ROTH?!". Many friends of mine told me not to finish the book anymore because I will get disappointed, and well.. I'm not that disappointed I was just sad until now because that happened and the death is simple as that. I called it simple because with all the things that happened from the previous book.. that's the only reason the character died. Well what more? I can't think of anything anymore this is so hard! actually, I tried to plan what to write in here but end up nothing. I hope this review makes sense though. I won't make this long anymore because seriously, how can you explain something that doesn't involve spoiling your readers? I might end up spilling things out and I'm sure not all people read Allegiant yet. SO! OMG people you have a choice either read the book or wait for the movie to come out BUT in my case I can't wait so I decided to just read and finish it. So.. this is such an awesome, heartbreaking, catchy book which every reader will love.